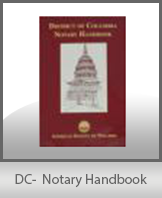 A MUST-have reference for all District of Columbia notaries. This handbook is a comprehensive "how to" reference for performing notarial acts. Includes notary terms and definitions, District of Columbia notary statutes, and sound notary practices.